← DC: NEW 52 Ending (In Name Only). Some books being cancelled, new books being launched. Lucasfilm’s sale to Disney has brought about many great things. Starting this year, Star Wars will be back in theaters, with the original cast returning too! The transition to Disney subsidiary has had a couple bittersweet side effects though…the loss of the Star Wars Expanded Universe and Dark Horse’s loss of the Star Wars license. Beginning in 1977, Marvel obtained the license to publish Star Wars comics, resulting in a run of 107 issues, which came to an end in 1987. Dark Horse scooped up the property two years later and has published it since. They were a very instrumental part of the creation of the Expanded Universe, helping to weave an incredible continuation of the stories beyond what had appeared on screen. However, after acquiring Lucasfilm, Disney seemed to say, “Wait a minute, why are we licensing out the comic book rights? We OWN a comic company!” And with that, they opted to not renew the agreement with Dark Horse, resulting in Star Wars coming “home” to Marvel this year. So, why do I bring all of this up? Well, both of these major changes factor into the new series in a big way. You see, Star Wars (2015) is not only the first Star Wars comic series in almost 3 decades to be published by Marvel, it’s also the first to come along in a “post Expanded Universe” world, working directly in the new “Official Star Wars Canon”. But how does Star Wars #1 stack up? Is it a new, brilliant, fresh start or a worrying sign of what’s to come? Read on, and we’ll find out. The rebellion has just recently lead a successful attack against the Empire’s ultimate weapon, and in the process landed a crippling blow. Now, a lone shuttle from Tatooine arrives in the Corellian Industrial Cluster on the moon Cymoon 1. Aboard it is Han Solo, working as an official emissary for Jabba The Hutt in a negotiation with the Empire over a deal for some supply depots. This is how the stage is set at the beginning of the book, taking place shortly after the end of Episode 4. 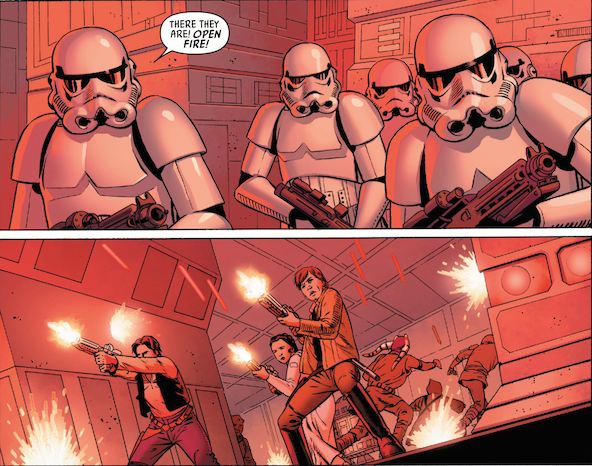 We are introduced to some Imperial officers and Han Solo alone, but soon enough the entire gang is back together and we’re jumping back into the old Star Wars crew we know and love (Even Obi-wan makes an appearance via Blue Ghost Speech Bubbles™). The best thing I can say about this comic, is it just feels right. The tone, the story…it’s all familiar, like meeting an old friend again after a long time apart. It plays out in a similar way to the Princess Leia rescue in Ep. 4, with disguised characters infiltrating, being discovered/revealed and then everything escalating into a gunfight. Threepio nervously reporting over comm-link, R2’s gadgets, Han & Leia bickering, it’s all here. There’s even a cute throw back to the Jedi mind trick. Contained in these pages are many of the same beats I have come to love (and want) from a classic Star Wars story. Jason Aaron’s script for this is just delightful (yes, I said delightful). I haven’t always enjoyed everything of his I’ve read, but I am so happy he is at Marvel now. It’s like he was made to write this. He nails everything. The characterizations and dialog is spot on. Han talks like Han. Threepio like Threepio, etc. Everything is written in a way that is just completely captures the characters and how they were portrayed in the original trilogy. I just realized Leia is now a Disney Princess. The art in this book is gorgeous. That’s to be expected though, it is John Cassaday’s work, after all. Cassaday’s likenesses are pretty ridiculous. He renders these actors almost exactly. The characters aren’t all there is to rave about though. His architecture is also incredible, invoking the style of the sets and props of the original films so well. Again, nothing feels out of place at all, even if you are reading this directly after watching Episode 4. In all, this is a very satisfying book. There isn’t a terribly huge amount of ground covered in it, but this is just laying the foundation for what is to come in the title’s future. From what has been shown so far though, once this book really gets rolling, it will be one hell of a ride.